Tech developed by the Ferrari FXXK could shape how tyres actively make cars safer. I really never thought that tires could be made intelligent like this, but man this is futuristic! It’s not just new track-ready hypercars and bruising German super saloons that’ve made their debut at the 2018 Geneva Motor Show. Pirelli has a new tyre. In other news, Greggs has a new pasty. We jest. Normally we wouldn’t bring you updates on new tyres, but we’ll make an exception for Pirelli’s ‘Cyber Car’ technology. You’ve heard of phones, thermostats and even entire cars connected to the Internet of Things. Soon, your tyre will be too, if Pirelli has anything to do with it. 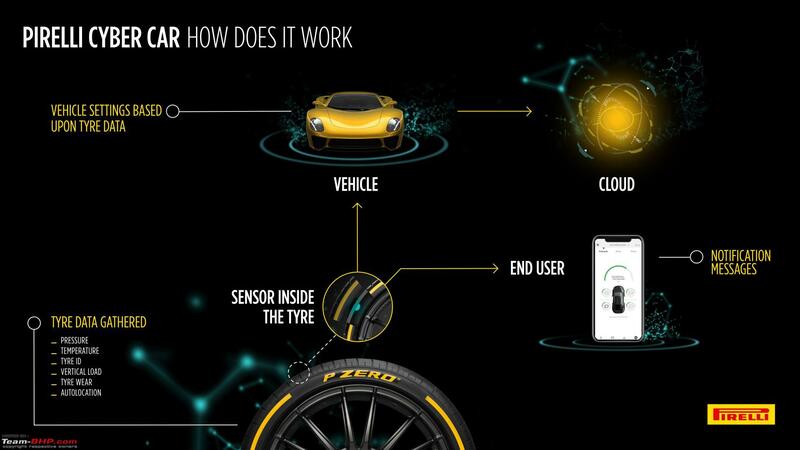 The idea of the cyber car – more accurately the cyber tyre – is that each tyre contains a sensor that records not just internal pressure, like regular tyre pressure monitors, but temperature, vertical load, wear and location. 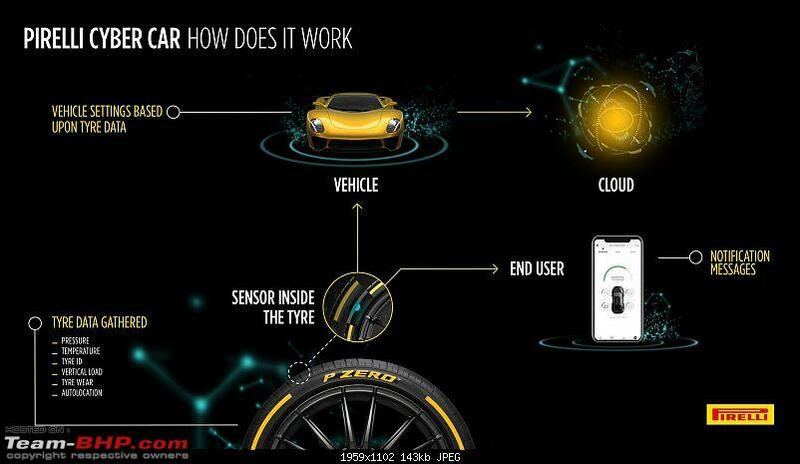 Now, Pirelli already has a similar system called Connesso, which then relays this data back to the driver via a smartphone app. But the Cyber Car goes further by taking the human out of the equation and just talking directly to the car itself, and loading data to the cloud. Why’s that useful? Well, for a start, the tyre can recognise when it’s cold, and likely to be slippery, and tell the car’s stability control and ABS to switch to a winter setting. Fine. But a car’s thermostat can do the same job. The tyre can go further, though. If it knows the vertical load going through it - and the pressure - it can work out the circumference of the tyre. This helps the car itself give a more accurate range indication – especially in electric cars, where the battery range can fluctuate wildly if tyres aren’t in good condition. But Pirelli’s really developing this with one eye on the future, for cars that aren’t really intended to have drivers at all. Think about the scenario of hailing a driverless taxi pod. There’s no human pilot to check the car’s vital stats, so the autonomous ‘car of tomorrow’ will have to maintain itself. If the tyre can tell the car it’s getting dangerously worn, suffering from low pressure or a puncture, it’ll know not to head off into service. And one of our glorious robot overlords can be dispatched to fix it. Pirelli says the tech is currently being tested with a number of carmakers, from EV makers and standard production cars to high-performance applications. The data used to invent this tyre has been harvested from lessons learned with Ferrari’s wild FXXK track-only special. The Italians admit there’ll be a cost implication for these super-techy new tyres, but thinks that can be offset when the likelihood of blowouts, breakdowns and fines for worn tyres becomes a forgotten concern. So, if you’re hopping into your new Ferrari in five years, bear in mind the moment you start pushing the limits of Side Slip Angle control, the tyre will be watching you. And learning. Gulp. Other than the PSI readings - that many cars are now offering as standard via TPMS - everything else is pretty useless. Tyre wear? Sure, but that's a topic visited once in 3, 4 or 5 years. However, this kind of data could be very useful for commercial vehicle operators (trucks as well as buses). Might also make life easier for fleet managers. Nice effort by their PR though. PR teams can usually talk about the 50 different colours of a plain vanilla white wall. All times are GMT +5.5. The time now is 14:21.